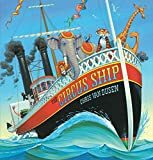 The circus ship / by Chris Van Dusen, author & illustrator. Material type: BookPublisher: Somerville, Mass. : Candlewick Press, 2009Edition: 1st ed.Description: 1 v. (unpaged) : col. ill. ; 27 cm.ISBN: 9780763630904 (lib. bdg. ); 076363090X (lib. bdg. ).Subject(s): Circus animals -- Fiction | Shipwrecks -- Fiction | Survival -- Fiction | Human-animal relationships -- Fiction | Maine -- Fiction | Stories in rhyme | Circus animals -- Fiction | Shipwrecks -- Fiction | Survival after airplane accidents, shipwrecks, etc. -- Fiction | Maine -- Fiction | Ships -- Juvenile fiction | Circus animals -- Juvenile fiction | Survival after airplane accidents, shipwrecks, etc. -- Juvenile fiction | Human-animal relationships -- Juvenile fiction | Maine -- Juvenile fictionGenre/Form: Stories in rhyme.DDC classification: [E] | E Summary: Left on their own to swim the chilly waters after their ship runs aground off the coast of Maine, a group of circus animals stagger onto a nearby island, quickly winning over the wary townspeople with their kind, courageous ways, and when the greedy circus owner returns to claim them, villagers of all species conspire to outsmart him. Left on their own to swim the chilly waters after their ship runs aground off the coast of Maine, a group of circus animals stagger onto a nearby island, quickly winning over the wary townspeople with their kind, courageous ways, and when the greedy circus owner returns to claim them, villagers of all species conspire to outsmart him.